Ever since the March 2011 Tôhoku earthquake, NHK has run an ongoing series of short documentaries featuring survivors of the disaster. With surprising objectivity, they deliver first-person accounts of the moment, recounting the tragedy then and the small triumphs since. The subjects of these vignettes are often shown standing on the concrete slab that remained of their home or business. Such scenes are becoming less common as the Japanese government pours billions into the recovery efforts, in some cases raising entire communities hundreds of feet above sea level. 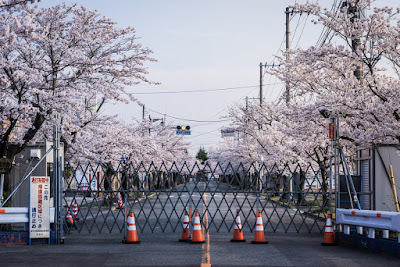 Last year, the NHK documentary series 72 Hours (in which a film crew camps out in a particular place for three days straight and interviews anybody willing to appear on camera) visited Yonomori Park in Tomioka, Fukushima, renown for its wide boulevards of lush cherry trees. Because of its proximity to Fukushima, only registered residents are allowed to visit the northeastern part of the town. The result is a kind of open-air Pompeii. Past the barricades, human civilization stopped in 2011, slowly being reclaimed by nature and repopulated by mildly radioactive boars. 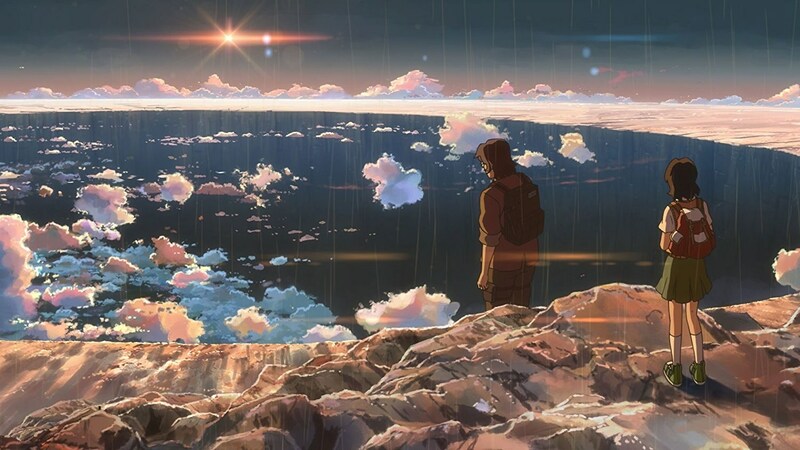 Makoto Shinkai wrote Your Name with this context in mind. In the alternate reality of Your Name, a disaster visits Japan on a smaller scale and in non-linear time. A rural town in Gifu Prefecture instead of rural fishing villages north of Sendai. But the parallels are clear. Still, Shinkai begins with a feint, a body-switching Freaky Friday physical comedy (though elevated to near transcendental levels by his gorgeous cinematography). Even there, his direction is laden with symbolism deeper and darker than the subject matter initially suggests. 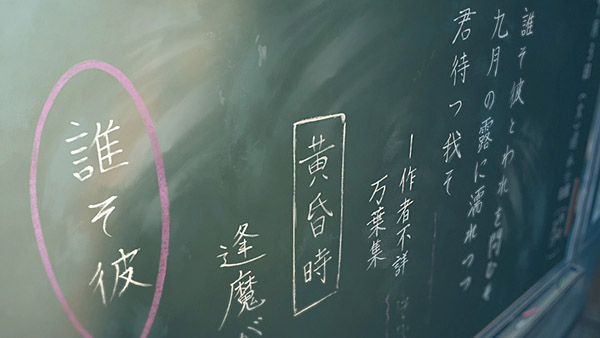 The first time we see Mitsuha in school, the teacher is explaining the etymology of tasogare ("twilight"). It was originally pronounced tasokare, literally, "Who are you?" In a world without artificial lighting, identifying a person at twilight could be tricky. 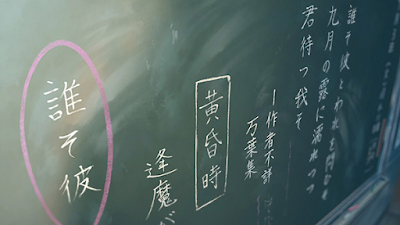 A moment later, Mitsuha turns a page and that question stares back at her from her notebook, written by Taki the last time he switched bodies with her. A word from classical poetry with Chinese roots, tasogare also suggests an otherworldly time when "gods and ghosts walk unnoticed upon the earth" (as I have Gendô explain in Serpent of Time). 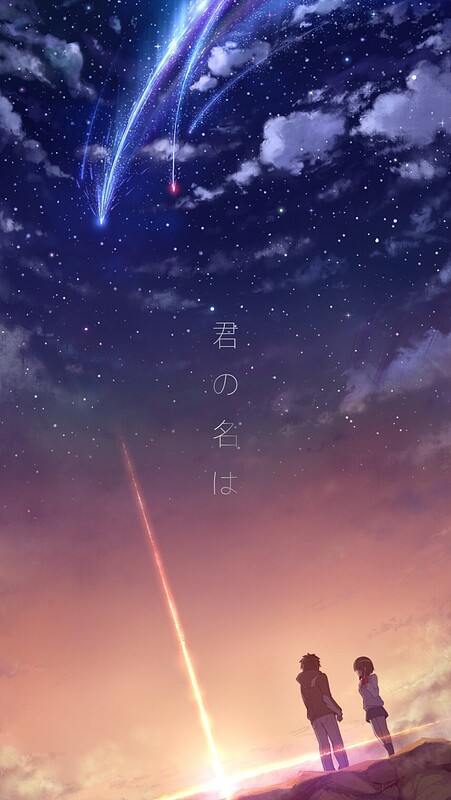 Only during the twilight can Mitsuha and Taki meet before their timelines realign. But the unifying metaphor that ties the film together is the red thread. 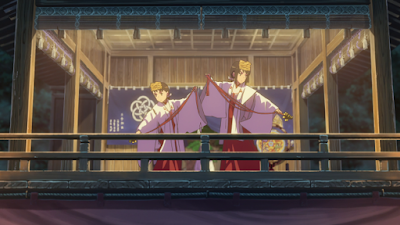 Originating in ancient China, the red thread of fate "connects those who are destined to meet, regardless of time, place, or circumstance. The thread may stretch or tangle, but it will never break." Mitsuha ties up her hair with a red ribbon and Taki wraps a red strap around his wrist every morning. Thanks to a Heisenbergian trick of time and place, it is the same red thread. More subtly, I believe that Shinkai is symbolically referencing his own work, namely Children Who Chase Lost Voices (2011). This retelling of the myth of Izanagi and Izanami (Orpheus and Eurydice) takes a young girl to the Gate of Life and Death in the center of the Underworld. 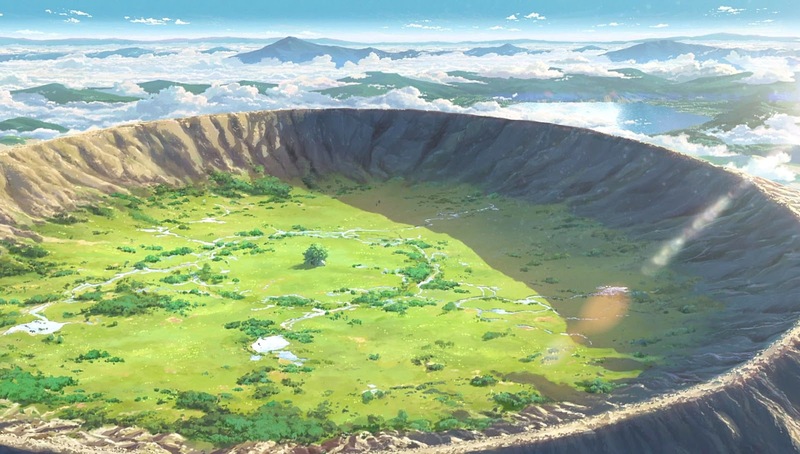 To get to the Gate, where Asuna hopes to find her father, she descends into a giant crater. In Your Name, The town of Itomori surrounds an impact crater. When Mitsuha, her sister and grandmother visit the family shrine within a metaphorical underworld, the site is in the center of an impact crater. In the wake of the 2011 disaster, hundreds of "tsunami stones" in the hills of coastal Japan attracted renewed attention. 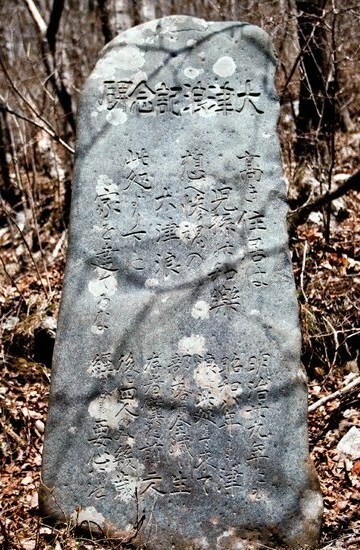 The stones marked the high-water mark of previous disasters. Geological data and historical records point to a "Sanriku earthquake" in the year 869 in the same Tôhoku region. And thus in Your Name, Shinkai's "Itomori Crater" was formed 1200 years ago and the comet, like the earthquake, has returned again. The past is prelude. Forgetting the past, Santayana warned, we are doomed to repeat it. There's no telling when Godzilla will come stomping in from the sea. Hence the curse of samsara, the "cyclicality of all life, matter, existence." All things pass away. All things come around again. And once more pass away. The pathos of life. 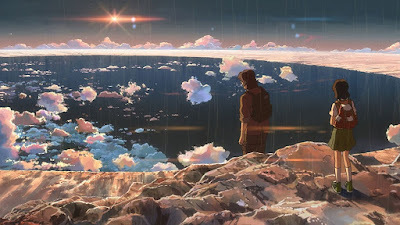 Mono no a'wa're is Shinkai's specialty, referring to the Japanese aesthetic concept of the beauty that can be found in the transitory nature of things, "a gentle sadness (or wistfulness) at their passing as well as a deeper gentle sadness about this state being the reality of life." And yet. Reinterpretations and extrapolations of Buddhist and Shinto metaphysics are part and parcel of Japanese fantasy. Reincarnation need not be a curse. While Children Who Chase Lost Voices is about accepting loss and moving on, Your Name circles around and rekindles hope anew. As does Ocean Waves, giving its characters a second metaphorical chance at a life that still-could-be. Angel Beats offers them rebirth and a second life (and a similar ending). Your Name splits the difference, suggesting that we can step outside of time and not become prisoners of fate. It is a message that Japan, particularly since 11 March 2011, very much wanted to hear.